Blaming poor school funding on bad Republicans is only half the story. I continue to be amazed in these declining days of neoliberalism by the adamant refusal of economic justice and public education advocacy organizations to name the elephant in the room. 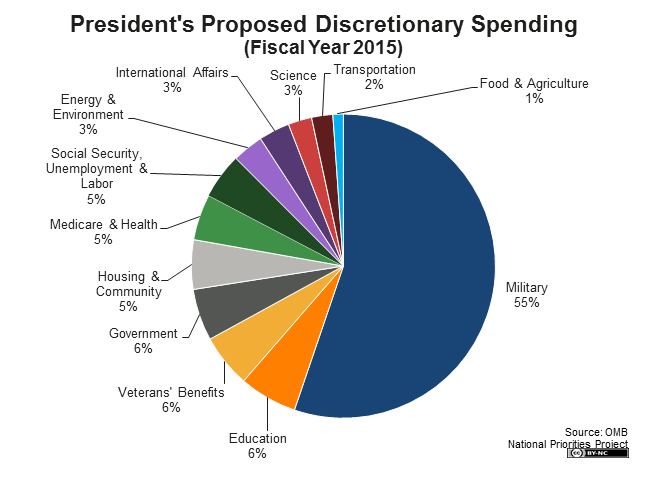 The elephant in the room is out of control military spending at the expense of programs that benefit actual people, such as SNAP food stamps for low income families, or quality public education starting at Pre-K. Also contributing to the problem: corporate tax breaks on the income side of the balance sheet. The elephant in the room is also a donkey, by the way. And therein lies the fundamental problem. Despite decades of evidence to the contrary, economic justice and public education groups continue to ignore the cold hard facts: wealthy corporate interests are represented by Democrats and Republicans alike, at the expense of the people. Click here for a letter to the editor tool created by Win Without War. Let your community know how you feel about the proposed FY16 federal budget. During the years when Obama's party controlled Congress, Pentagon contractors continued to make huge profits. Meanwhile, vast numbers of workers had two or three part-time jobs that fail to produce a living wage. And schools in low income neighborhoods were underfunded year after year. If education is the path out of poverty, what message is U.S. corporate-controlled government sending to children going to school? According to a landmark study by the Southern Education Foundation, the number of states where more than half of students qualify for free or reduced lunch quadrupled in ten years. "Get out of here, you low-life scum" snarls Republican Sen. McCain at antiwar protesters from Codepink. juxtaposed with articulate, highly educated donkeys on the other. But donkey budgets look like the people who made them aren't intelligent at all. There is always a giant slice of the pie for the Pentagon (which includes the NSA spy-industrial complex) and crumbs for welfare and public education. Not only is unequal access to education and public services for kids a bad investment for our collective future, it is also unfair, often in a racist way. From "The Engagement Gap: Social Mobility and Extracurricular Participation among American Youth" by Kaisa Snellman, et al. Over the past two generations, the difference in educational achievement between the children from poor families and that of children from wealthy families has grown substantially. Whether we look at standardized test scores, college admission, or college graduation, the achievement gaps between children from upper-middle-class families and children from working-class families are steadily increasing. Today, the income gap in test scores is 40 percent larger than it was three decades ago (Reardon 2011). For high-income students, the college graduation rate increased by 18 percentage points over the past two decades; in contrast, the graduation rate of low-income students grew by only 4 percentage points (Bailey and Dynarski 2011). Moreover, wealthy students make up an increasing share of the enrollment at the most selective and prestigious four-year institutions (Reardon, Baker, and Klasik 2012), while low-income students with similar test scores and academic records are more likely to attend two-year colleges (Alon 2009; Hoxby and Avery 2012). 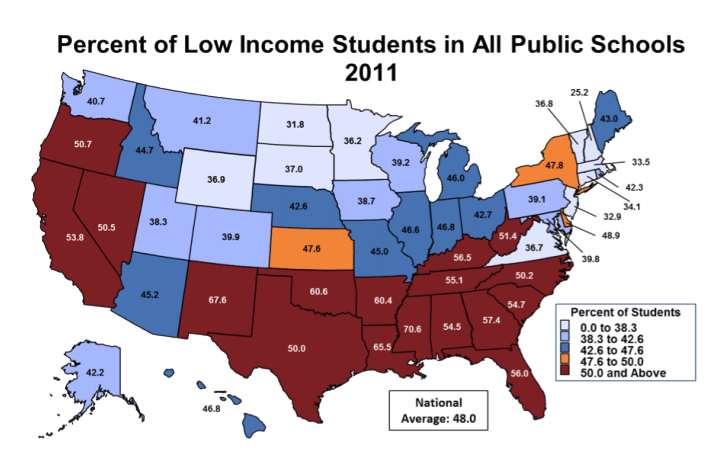 And inequity extends far beyond the crumbling walls of inner city schools. What kids do after school is affected by poverty, and poverty is affected by what kids do after school. ...new analyses of four national longitudinal surveys of American high school students that reveal a sharp increase in the class gap in extracurricular involvement. Since the 1970s, upper-middle-class students have become increasingly active in school clubs and sport teams, while participation among working-class students has veered in the opposite direction. A vicious cycle that the fight over donkeys vs. elephants willfully ignores.